Necomplus attended the 12th edition of Merchant Payments Ecosystem (MPE) in Berlin, an opportunity to obtain fresh views on the payments space from merchants, acquirers, PSPs and new entrants promoted by regulatory changes. The discussions on NextGenPOS Track inspired me to write about our views regarding the future of payments and the Electronic Funds Transfer POS (EFT-POS) within the context of new shopping experiences crafted mainly by leading non-financial players who are strongly entering the payments industry. There is a general consensus around the idea that the evolution of technology combined with regulatory changes (PSD2 in UE) have pushed the payments industry into new horizons, where traditional roles in the value chain are being challenged. Financial institutions have traditionally seen the payments business as a private courtyard and now start to see new entrants “moving their cheese”. It is critical for them to adapt their strategies in order to ensure long term sustainability of their business models. Large online merchants such as Amazon, Alibaba and the likes at the forefront, are creating new shopping experiences in a true omni-channel environment. These are supported by the boom of start-ups creating a range of innovative solutions under the PSD2 umbrella in Europe. The newcomers to the payments industry, present a new shopping experience where the payment itself is not a critical customer touchpoint, but rather an “invisible” moment, evolving from today’s physical interaction between a EFT-POS and a payment instrument (plastic card, virtual wallet, QR…) into a seamless, invisible part of the shopping cycle. Definitely some shopping experiences call for simplification in order to avoid queueing at the checkout desks. Especially in repetitive purchasing patterns (eg. grocery store, supermarket, parking…) the client may see the paying experience as a daily hassle. Taking this view into account, simplifying the payment device is presented as a great opportunity for acquirers, ultimately leading to the use of smartphones enabled by PIN on Mobile (PoM) and a small piece of hardware (Secure Card Reader). But will this be a massive trend? Will retailers rely on clerks’ or customers’ mobile phones to handle a sensitive aspect such as payments? Newcomers’ vision underestimates the role of financial institutions, who have a longstanding relationship with merchants through the EFT-POS as a central element for payments. Banks should think twice about giving away this “piece of hardware” linking them to merchants, but rather transforming its functionality to deliver a much richer experience. 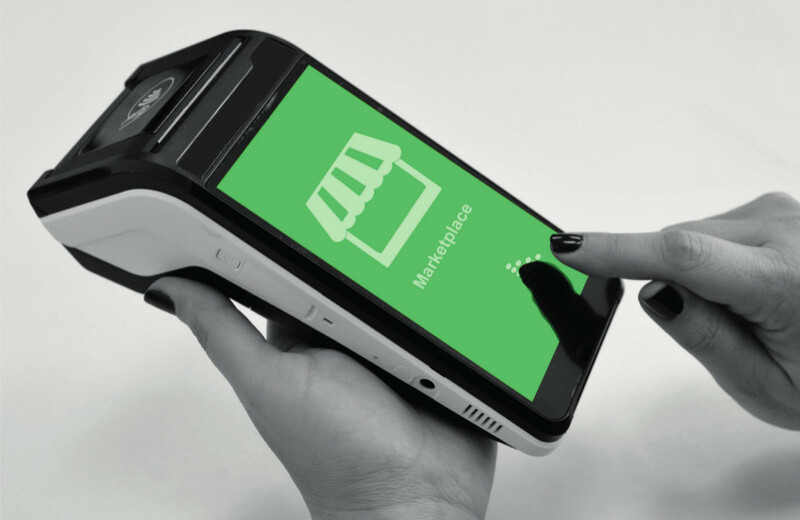 Pure Android POS manufacturers have already shown the potential to bring functionality and design to the next level. In most cases, paying is where the merchant links to the customer and has, now more than ever, a precious opportunity to interact with him, offering him in a natural way true targeted propositions, ultimately transforming the purchase into a pleasant experience. Nothing compared to the current payment experience with a standard EFT-POS which is a merely transactional event we would all be happy to simplify. Now imagine for a moment a new payment experience where a tech-savvy customer, seated in a restaurant is given an “intelligent device” that offers him the opportunity to interact on his own, creating an “extended check-out” experience. The customer can not only pay the bill (getting the receipt by email), but also provide feedback and be able to tip the waiter, recommend the place to friends through social networks, earn loyalty points, ask for a taxi service or even buy tickets for leisure events nearby (if interested). And now, imagine this restaurant experience personalized for different industries. The list of examples is huge (we see it in Fashion, Technology, Health & Beauty stores…) and it calls for a segmented approach by industry and retailers’ size, based on the different customers’ use cases. Definitely in some situations we will want the payment experience to be seamless, but in many others quite the opposite, merchants and buyers may see the “checkout process” as something beyond payment. Industry players, mainly financial institutions who own the relationship with merchants, especially medium and small ones, should lead the transformation of the “payment event” into a much wider and richer experience, turning it into an “extended checkout” enabled by new technologies. Technology, regulatory changes and new entrants are transforming the payments industry. Large retailers, newcomers to the payments industry, are defining a whole new shopping experience where paying may become seamless or invisible to the customer. However, this does not apply to all customers’ use cases. Merchants have a genuine opportunity to transform the “checkout process” into a new window to offer truly segmented value-added services to the customer. Helping merchants to craft this experience, represents a tremendous opportunity for incumbents (mainly financial institutions), to maintain their existing relationship with merchants and defend their position across the value chain. At Necomplus we believe the future of payments may not be defined just as “seamless” but putting customers first, the payment experience has to exceed their expectations in completing a satisfactory shopping experience, whatever that may mean: Whether it is an “invisible payment” (“Grab & Go” experience), or an “extended checkout” interacting with an intelligent device offering a new range of targeted services including the payment.